*Edition and States: A separate edition of ten first state proofs exists. The PhMA impression is from this edition. Paper and printing technique: At least some impressions from the edition of this lithograph are printed on chine collé. This technique was a favorite with Fiene's Paris printer Edmond Desjobert. **Dimensions: The dimensions of both the image and the top or pasted sheet of the chine collé are given. More often than not the ink of the image runs to the edge of the top sheet, and even, occasionally, spills over onto the backing sheet. ***Annotations: The chine collé impressions are generally signed on the backing sheet just below the pasted top sheet. Gallery Reference and Provenance: Both the BIAA and PhMA impressions are gifts from Edith Halpert, who was proprietor of The Downtown Gallery. Impressions from this gallery often bear the gallery's stamps. Setting and Model: Fiene writes that during his stay in Paris in 1929, his friend the painter and printmaker Jules Pascin, at one point, lent him his studio on the Boulevard Clichy, and as a result, Fiene writes, he "inherited some of his charming models. (Fiene "Jules Pascin"). 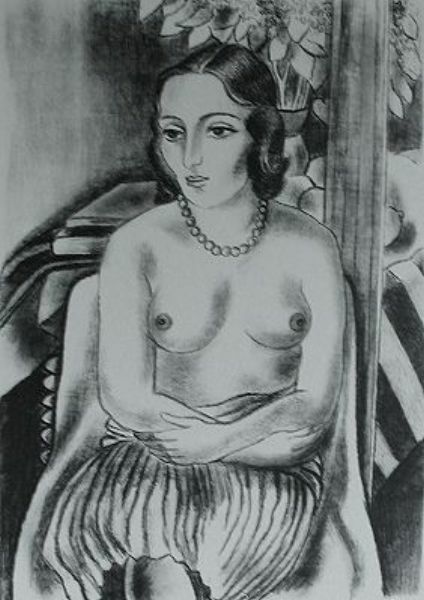 It is only speculation, but the model here may have been one of Pascin's and the setting, Pascin's studio. Commentary: The influence of Matisse is obvious in this work and other figure studies from this period. When Fiene was studying in Paris in late 1928 and 1929, he met Braque and Derain but was influenced most strongly by Matisse. In turn the French master of the simple but evocative line visited New York in 1930 and granted special praise to a Fiene painting in a Museum of Modern Art exhibition. Perhaps Matisse recognized his own influence in Fiene's work. (Hyman, opp. fig. 2. ).